Scientists with the U.S. Geological Survey (USGS) recently completed an assessment of our Nation’s geothermal resources. Geothermal power plants are currently operating in six states: Alaska, California, Hawaii, Idaho, Nevada, and Utah. The assessment indicates that the electric power generation potential from identified geothermal systems is 9,057 Megawatts-electric (MWe), distributed over 13 states. The mean estimated power production potential from undiscovered geothermal resources is 30,033 MWe. Additionally, another estimated 517,800 MWe could be generated through implementation of technology for creating geothermal reservoirs in regions characterized by high temperature, but low permeability, rock formations. 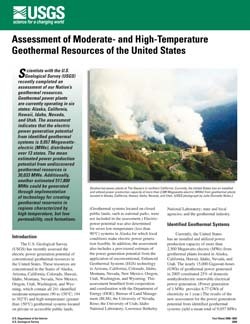 Williams, Colin F., Reed, Marshall J., Mariner, Robert H., DeAngelo, Jacob, Galanis, S. Peter, Jr., 2008, Assessment of moderate- and high-temperature geothermal resources of the United States: U.S. Geological Survey Fact Sheet 2008-3082, 4 p.
This report is presented in Portable Document Format (PDF); version 6 or higher of Adobe Reader or similar software is required to view it. Download the latest version of Adobe Reader, free of charge.